If you are buying or selling an example of this Dinky toy/model use our Price Guide to obtain values for mint or playworn examples. Valuations are an essential part of any buying or selling decision. 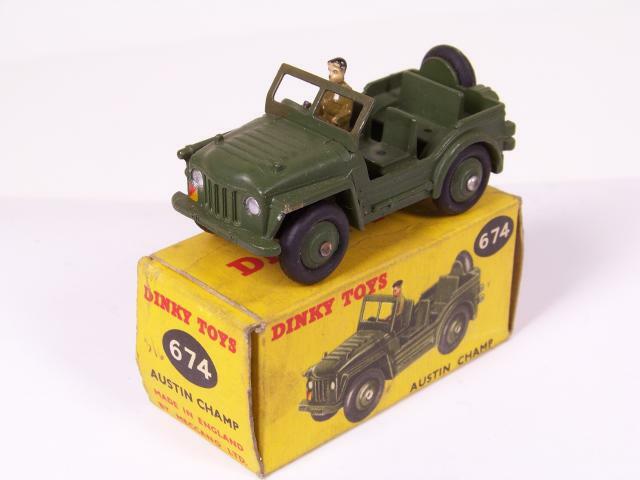 You will find multiple sets of search results (from eBay) for Dinky 674 showing items for sale and links to other ToyMart advertisers which will help you locate and compare prices before you buy or sell a Dinky 674 Austin Champ. Diecast vehicles with plastic driver. Dinky 674 Austin Champ recent nudging activity is updated every 24 hours. AUSTIN DILLON #3 2013 CHEVROLET IMPALA SS ADVOCARE "NATIONWIDE CHAMP CAR"